Hi! This guest post by Sha-Myra is a fantastic treatise on how the movie Edward Scissorhands starring Johnny Depp showed how able-bodied people were perceived to have treated the disabled. Edward Scissorhands is a classic film. The film depicts a young Johnny Depp as a scientist creation companion. However, his creator suddenly dies and he is left unfinished. As an actor, I found this film relatable. 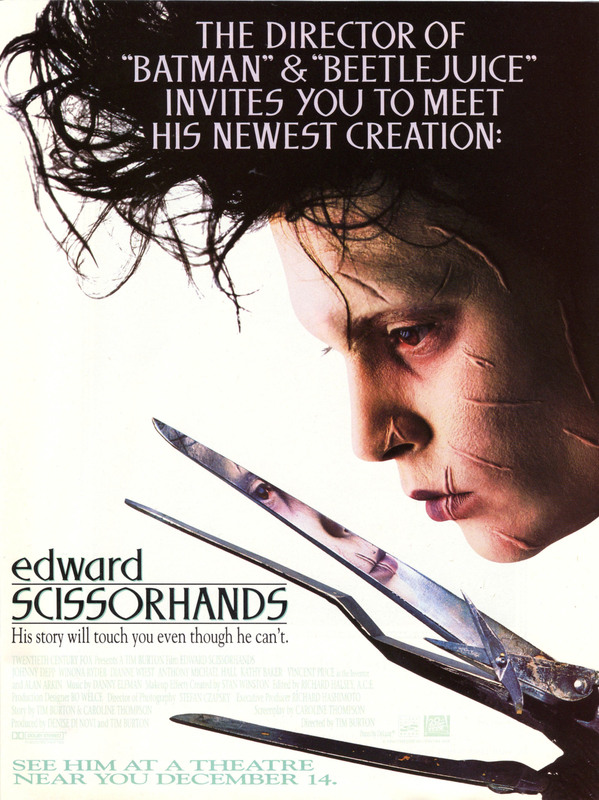 Points that no one notices-In the film he has scissors for hands and there are many things that Edward can’t do, however despite his “handicap” he does amazing things for the fictional town and is the most genuine character out of everyone in the entire film. This film was also one of the first times the main character carried a major mainstream film with a handicap. The film shows many common stereotypes as well as major things that other people often ignore when interacting with someone who is disabled. Edward learns feelings of empathy, anger, love, resentment, remorse and confusion throughout the film despite his “deformity”. As in real life, people focus on what’s in it for them instead of just appreciating simple qualities when befriending a person with disabilities. I also noticed that just like in real life everyone had their specific biased attitude toward Edward and were never concerned with what he wanted. He was only cared for when he was useful or a spectacle. Once he became a nuisance everyone ignored him except the love interest depicted as a wide-eyed blonde played by Winona Ryder. The film shows you as a whole why people with disabilities are treated badly and end up isolated often. Disabled people deserve the same chances to live and act as much as anyone else. Disabled people are not burdens or tragedies. Disabled people have a right to be treated with dignity and respect that we give others. Disabled people are not charity cases or inspirations. Disabled people deserve the human right to be themselves without needing to be useful. Disabled people are not children and do not need ableist people making their decisions and assuming superiority. The Guest Blogger, Sha-Myra is a disability activist and huge film buff from DeKalb, Illinois. Sha-Myra believes in accurate media representation. She also performed in the theatre for six years. Thanks for your compliment! Please sign up for our newsletter list. I haven’t been doing this for very long, so I can’t give you any advice except to just start blogging. I am sure you will get followers if you have a diary of your thoughts already. Magnificent web site. A loot of helpful information here. Can you send me an email to fun@fun4thedisabled.com when you quote me along with the blog posts? Please do keep up the fsntastic jo. Thank you so much! If you have suggestions for new content, please let me know! was an amusement account it. Looks advanced so far added agreeable from you! The guest blogger is an incredible writer and I will tell her how much you enjoyed her post! To get my information on a consistent basis, please sign up for my newsletter! very hard to get that “perfect balance” between superb usability and appearance. Thanks, I’ll ask the guest blogger. Overall, what a great site and informative posts, I will upload inbound link – bookmark this web site? Regards, Reader R.
Thanks for the compliment. I’ll keep trying to supply content for the site! In addition to bookmarking, you can sign up for the newsletter, just by providing your name and email address! I will let the blogger know. You should both sign up for the newsletter! Thanks for a marvelous posting! I really enjoyed reading it. Twitter handle is @fun4thedisabled, thanks! Have you ever considered about adding a little bit more than just your articles? I mean, what you say is valuable and all. Nevertheless just imagine if you added some great photos or video clips to Give your posts more, “pop”! Your content is excellent but with images and videos, this website could undeniably be one of the very best in its field. Excellent blog! You should check out my videos for my other posts, and sign up for the newsletter. I do include videos and still photos in the videos as well. Thanks! Hello there! This post couldn’t be written any better! Reading through this post reminds me of my previous roommate! He always kept talking about this. I will forward this write-up to him. Fairly Certain he will have a good read. Many thanks for sharing! Thank you very much. He should sign up for the newsletter. You could certainly see your enthusiasm in the work you write. The arena hopes for more passionate writers such as you who are not afraid to say how they believe. All the time go after your heart. I will tell the person who wrote it. Thanks! I got this site from my pal who shared with me concerning this website and at the moment this time I am browsing this web site and reading very informative content here. Great! Sign up for the newsletter and come back! fantastic publish, very informative. I’m wondering why the opposite experts of this sector don’t understand this. You must continue your writing. I am sure, you’ve a great readers’base already! I will let the writer know. I know she’ll be very excited about your compliment! Hello, i LOVE to check blog posts here in the early hours in the morning, since i like to learn more and more. KEEP COMING BACK! Check out the latest ones! I really like what you guys are usually up to. This type of clever work and reporting! Keep up the wonderful works guys I’ve added you guys to blogroll. Greetings from Los angeles! I’m bored to death at work so I decided to browse your blog on my iphone during lunch break. I love the information you present here and can’t wait to take a look when I get home. I’m surprised at how fast your blog loaded on my cell phone .. I’m not even using WIFI, just 3G ..Anyhow, great blog! Heya i am for the first time here. I found this board and I find It truly useful; it helped me out much. I hope to give something back and aid others like you helped me. Interesting post-on-ambiguity and precious knowledge about unpredicted emotions. We are a group of volunteers and opening a new scheme in our community. Your website offered us with helpful info to work on. You’ve performed a formidable job and our whole neighborhood is grateful to you. I’m really impressed with your writing skills and also with the layout on your weblog. Keep up the excellent quality writing, it is rare to see a nice blog like this one today. Thanks! This was a guest post. But the blogger is really an excellent writer. I’ll let her know how much you appreciate it. It’s actually a great and helpful piece of info. I am glad that you shared this helpful information with us. Please stay us up to date like this. Thanks for sharing. Can I simply just say what a relief to discover somebody that actually knows what they are talking about on the web. You know how to bring an issue to light and make it important. A lot more people ought to read this and understand this side of your story. I was surprised you’re not more popular because you definitely possess the gift. You can find the contact us page by going to the top of each page or going to the menu. Sorry you missed it! Looking forward to your suggestions. You can also sign to receive the newsletter on a regular basis. Asking questions is good if you are not understanding anything fully. This post covers its subject well. Great suggestion. Most of the posts are videos. Please check out one of the videos and let me know your take on that. Please consider signing up for the newsletter. Hello, every time I used to check webpage posts here early in the morning, as I enjoy finding out more and more. Hello there, just became aware of your blog through Google, and found that it’s really informative. I’m gonna watch out for it. I’ll be grateful if you continue this in future. Lots of people will enjoy your writing. Cheers!